FS226P - 1/4 in. - FJT Series - Straight-Thru - Push-On Stem - Socket - 45 Degree Hose Stem - 3/8 in. Foster FJT Series couplers are designed to connect coolant lines to plastic molds and diecasting dies. FJT Series plugs are mounted in the mold. They can be threaded directly into the mold coolant ports or recessed into the mold for a flush surface during storage. 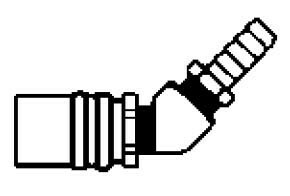 Sockets have hose stems, either standard hose or “Push-on” type, for direct connection to the coolant line going to the manifold. Seal compound is silicone for use with water, ethylene glycol, or air.